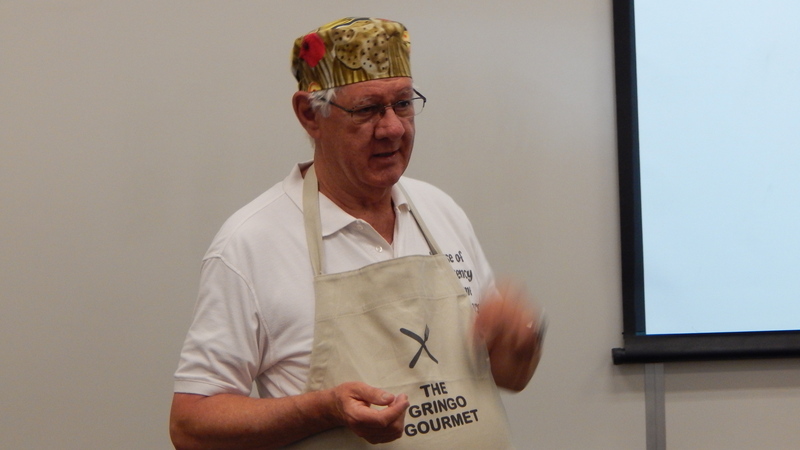 I had the pleasure of being invited to do a Gringo Gourmet Cactus Cooking talk at the Sierra Vista Master Gardeners Annual High on the Desert Gardening and Landscape Conference in March. It was fun to introduce the Arizonans to new ideas about enjoying prickly pear cactus. One of the audience told me I had just changed her menu for a dinner party she was planning. 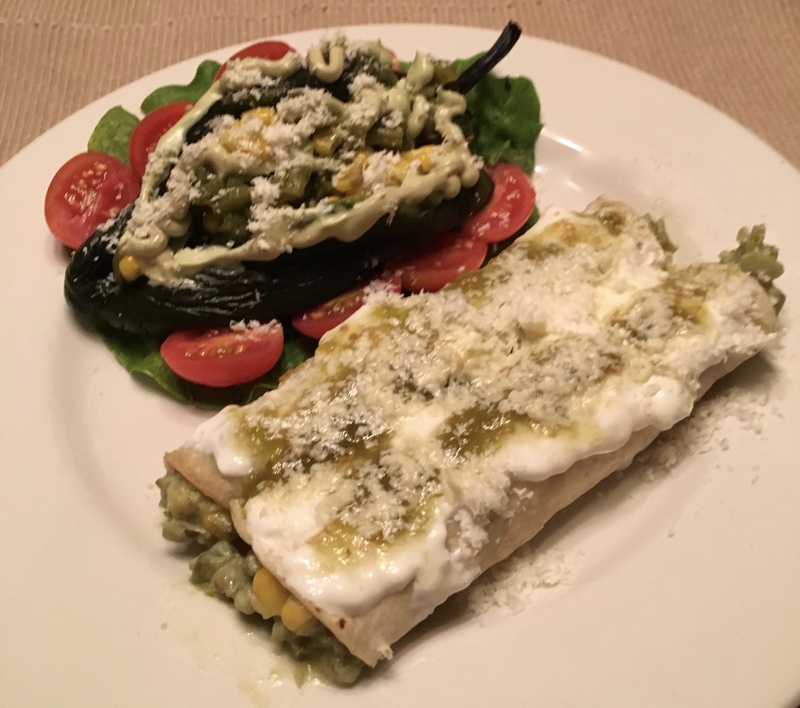 I shared a recipe I developed with ingredients for the filling of the Nopal Chile Rellenos at a favorite El Paso restaurant – Sabertooth. I tweeted it a little to make it my own and enjoy serving it cold and as an ingredient in hot dishes. 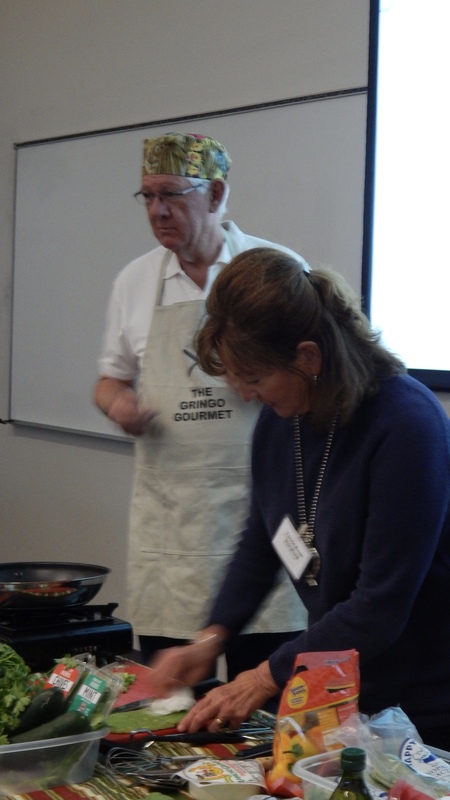 The Sierra Vista group got to taste it on mini-sweet peppers and on a tortilla as a mini taco. I’ve posted the it below with a photo of a couple of ways I use it. Both will be featured in the next El Paso Cactus and Rock Club News letter in April. Daughter Emily had this apron made for Christmas. A sous chef from the audience. Fellow El Paso Master Gardener Doc Stalker did a great talk on Roses in the Desert at the conference. We West Texan Master Gardeners have a lot in common with our Arizona friends. We’re glad that we were able to share some of your experiences with them. 1 guacamole salsa – jarred or made fresh (if making fresh, add lime juice to prevent discoloring of the avocado. Sauté nopalitos in olive oil until sticky secretion is reduced. Add one Tbsp water at a time to create steam and accelerate evaporation of sticky stuff. Nopalitos are done when dark green and majority of sticky stuff is gone. At this point, you may choose to rinse the nopalitos to get all the sticky off. Add chile if using fresh. If using jarred, let drain in a colander. You might need to press some moisture out. Pour frozen corn into a hot dry skillet. Stir and let the corn thaw and take on a little brown color. You may use fresh corn cut off the cob, in season. Mix nopales, chile and corn together. Stir in crema until moist, but not too wet. Halve and seed mini colored peppers. Stir whipped cream cheese into Magic Mix to get the consistency of a dip. And serve with the halved peppers and/or tostadas. Add more crema to Magic Mix to moisten and layer with corn tortillas in a casserole dish. Sprinkle with cotija cheese. Heat in a 350 oven until heated warm through and cheese is soft. Garnish with squiggles of avocado salsa and serve. Note: do not over heat because the crema will break. You can even add a few spoonsful of guacamole salsa to the Magic Mix. Use a spoon or your finger and clean the Magic Mix bowl. That’s the cook’s reward! Gringo Gourmet Magic Mix on the Plate. Gringo Gourmet Magic Mix in a poblano pepper as a cool relleno salad and as a filling for enchiladas topped with Mexican crema and tomatillo salsa. It is a very versatile mix for you to try. Share your ideas, please. Some of my great- and great-great ancestors were Irish on my mother’s side. A bit of red or rich auburn hair pops up from the gene pool now and then. And I believe it is the Irish in me which is responsible for my fondness of a good stout and the occasional Black and Tan at a cozy pub and perhaps a sip of Jameson’s now and again. My sister used to amuse us with a couple of drops of green food coloring in beer when she made a St. Patty’s Day dinner for the family. This year, I celebrated St. Patrick’s Day wit a traditional corned beef and something newly discovered – colcannon. Colcannon – potatoes, cabbage, leeks, garlic butter and cream; what’s not to love about that? 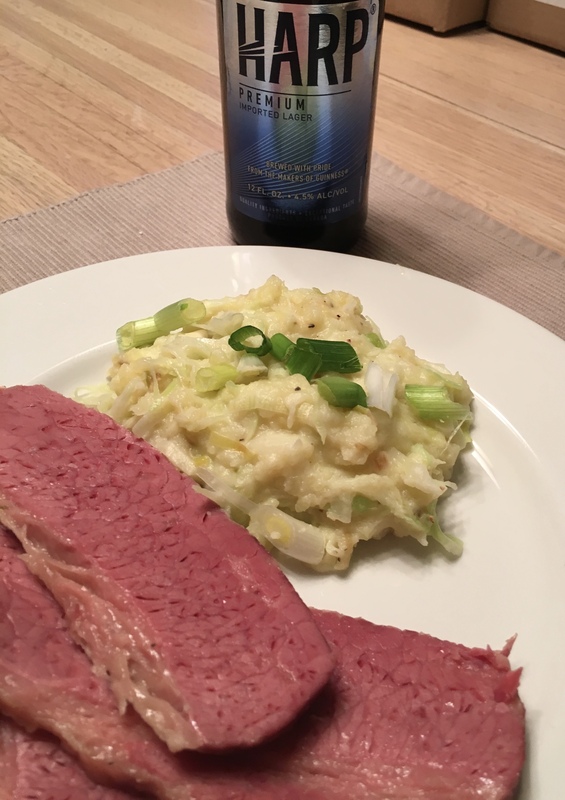 Colcannon is a very rich and savory side dish that was a perfect complement to my boiled corned beef. It is a potato, cabbage and leek based mash with butter cream, garlic and a garnish of scallions. Super comfort food on the plate that will be made again long before St. Patty’s Day next year. Corned beef, colcannon and a bit o’ Harps lager in homage to St. Patty and the Irish in me. Meanwhile, melt 4 Tbsp. butter in a large saucepan over medium heat. Add leeks and cook, stirring frequently, until very soft, 8–10 minutes. Add garlic and cook, stirring frequently, until garlic is fragrant and leeks are just beginning to brown around the edges, about 3 minutes longer. Add 1 cup cabbage and cook, stirring constantly, until wilted. Add milk and cream and bring to a simmer. Add potatoes and remaining 1 cup cabbage, then coarsely mash with a potato masher. Season with salt and pepper. Transfer colcannon to a large serving bowl. Top with remaining 2 Tbsp. butter and sprinkle with scallion. 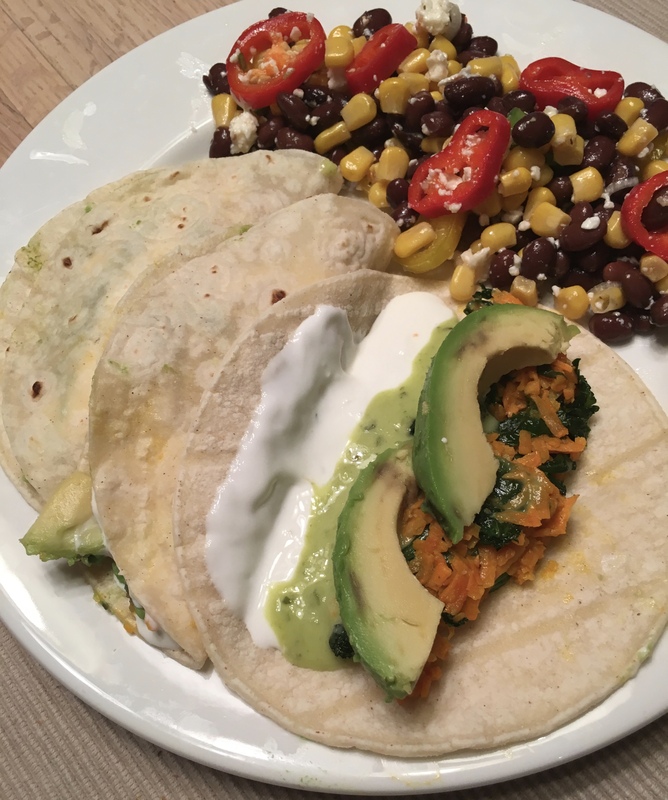 When I saw a recipe for “Green Tacos” I said, “Naw, that ain’t right.” I kept thinking about it and went back later and decided it read very well so I’d give it a try… vegetarian though it was. The filling had a couple of my favorite vegetables – sweet potatoes and kale. An avocado garnish was the clincher. The recipe called for crema mexicana (Mexican style sour cream) that I just happened to have on hand. I added a little of a new favorite treat, an avocado salsa new on the market under the Herdez label. 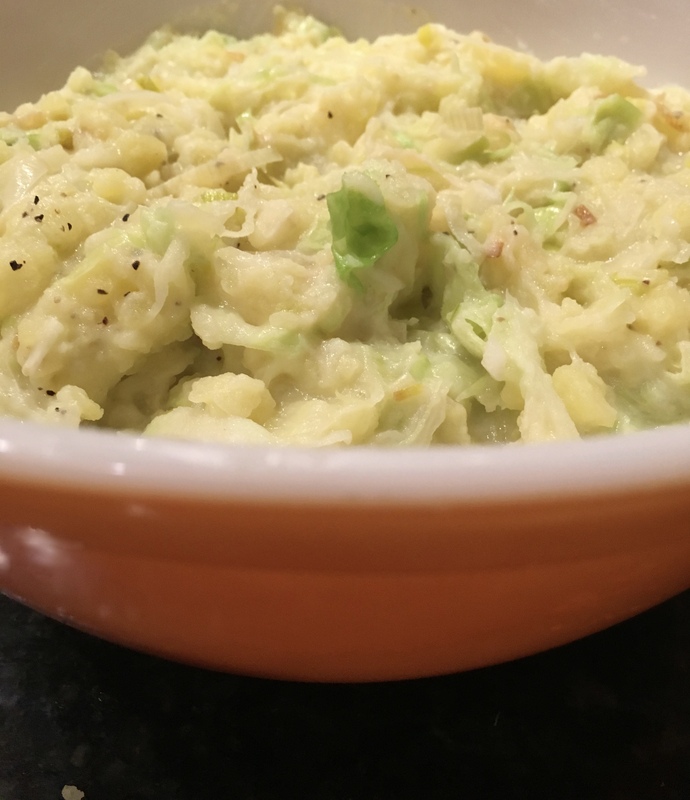 It has a little bite to it, but is a very nice jarred creamy avocado sauce that has been good on everything I’ve put it on. With my “healthy” appetite, it didn’t hurt to have a simple salad on the side. Black beans, corn, sliced sweet peppers and scallions tossed with a simple vinaigrette and chilled for a couple of hours hit the spot. Green Tacos are on the keeper list for a light lunch or supper. Heat oil in a medium saucepan over medium heat. Cook sweet potato and garlic, stirring often, until potato is tender and just beginning to brown, 8–10 minutes. Add kale and cook, tossing often, until kale is wilted and tender, 8–10 minutes. Add lime juice and season with salt and pepper. I saw a recipe that sounded very good – White Bean and Farro Pesto Bowl. I enjoy farro, a type of wheat usually served boiled as a base or part of a recipe. It has a great nutty flavor and good texture. I can sometimes find it at a co-op market in Las Cruces, a mere 45 minute drive away. I have not found it in El Paso and hope that a Whole Foods store scheduled to open in the fall will give me better access to some special foods. The clincher in the recipe for me was cannellini beans and pesto. These white kidney beans are a staple in my pantry and pesto is always a treat. My original intention was to do the original recipe and save it from being a vegetarian dish by adding some hot Italian sausage. I promised myself I’d make it another time by the recipe. More goodies in the recipe were kale or spinach greens and roasted grape tomatoes. I was on a roll last night. No farro and no cookies at the time I got there. I decided I’d punt and make the recipe with the addition of Italian Sausage and serve it on polenta instead of farro. The resident house food critic gave it five stars. He’d rate anything with sausage in it as five star! I thought it was very good, too. 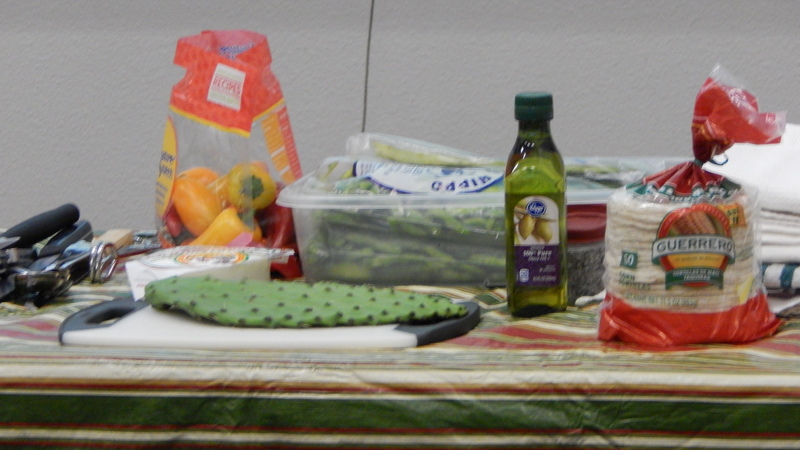 I really enjoyed the bean and pesto flavors together and the way they looked on top of the greens and sausage. 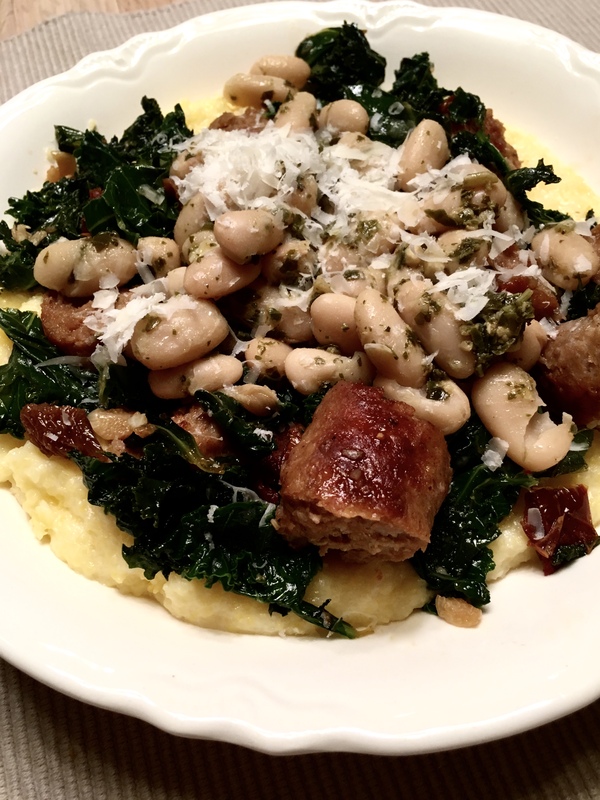 Here’s my recipe for Polenta Punt and Run with Cannellini Bowl. Bring water to boil and slowly stir in polenta; reduce heat to a simmer, cover pot and cook, stirring occasionally until tender; when done (about 12-15 minutes) stir in butter and half and half and let come back up to temp (polenta will bubble and spatter if you are note careful). Cover and remove from heat, but keep warm. If it thickens too much, add a light splash of extra chicken broth to thin. Remove casings from sausage, trying to maintain their shape and brown in a covered medium skillet. When sausages are getting color and have firmed up, slice them into 1-inch bite-size pieces. Continue to brow until sausage is done, then remove from pan. Remove all but 1 Tbsp sausage drippings from pan and toss in the chopped garlic. Cook in drippings until tender (about 3 minutes) and add the chopped sun dried tomatoes. When tomatoes are warmed, add the chopped kale and chicken broth. Cover and cook until kale wilts and is tender. Set lid aside and let kale cook until chicken broth has almost evaporated. Stir until kale, garlic and tomatoes are well mixed, add sausage, stir into greens and let warm up again. Zap drained beans about 30 seconds to warm them, stir pesto into beans. Dish pesto into two shallow bowls, top with greens and sausage mixture. Add the cannellini beans in the center of the greens and sprinkle with the cheese. Italian style comfort food to enjoy until I get my hands on some farro.